I have only seen the heading and can only imagine the readers from our easterns neighbors getting on your case. How dare you said some thing positive about Pakistan and something negative about India - blabla bla bla. G.Ali: "I have only seen the heading and can only imagine the readers from our easterns neighbors getting on your case. " Unfortunately, you are right. Some of them can't stand to see Pakistanis even a little bit happier than they are. I have already gotten a bunch of comments laced with some of the worst profanities. While differing perspectives on my posts are welcome, I do not publish outright senseless abuse. We could be far happier and at higher position in the table than we are if we only had few politicians who were happy with the loot they have and diverted their energies towards development instead of plundering and gathering more loot. And of coures, if we had no load shedding. A good read and has the basis to be expanded into Pakistan’s educational review. Soaring food and fuel prices are threatening to derail growth in Asian economies, according to a report by the Asian Development Bank (ADB). The bank has warned that if food and fuel prices continue to surge, economic growth in the region could be reduced by up to 1.5% this year. According to the bank, domestic food prices have risen at an average of 10% in many Asian economies this year. Oil prices have also surged because of the crisis in the Middle East. The bank said that a combination of these two factors has been a major setback for growth in Asian economies. While Asian economies have emerged strong from the global financial crisis, the rising cost of living has become a big concern in the region. The ADB has warned that the recent surge in food price is threatening to push millions of Asians into extreme poverty. According to the bank's study a 10% rise in domestic food prices may result in almost 64m people being pushed into extreme poverty. According to the ADB's chief economist, Changyong Rhee, "for poor families in developing Asia, who already spend more than 60% of their income on food, higher prices further reduce their ability to pay for medical care and their children's education." "Left unchecked, the food crisis will badly undermine recent gains in poverty reduction made in Asia." he added. The bank also warned that food prices will remain volatile in the short term. It said that while there have been production shortfalls in some countries because of bad weather, prices have also been pushed up by other factors, such as the weakening US dollar and rising fuel costs. This has resulted in many countries imposing export bans on their produce, a practise that is not helping the cause, according to the bank. "To avert this looming crisis it is important for countries to refrain from imposing export bans on food items, while strengthening social safety nets," said Dr. Rhee. "Efforts to stabilize food production should take centre stage, with greater investments in agricultural infrastructure to increase crop production and expand storage facilities,"
Dr Rhee added that these measures will ensure that food produce is not wasted, thus helping to keep prices in check. Here's a story from the Economic Times (16/04/2011). It was headlined saying - "Growth in India, China helped in poverty eradication: WB, IMF". WASHINGTON: Rapid growth in economies like India and China has helped millions of people escape the dungeons of poverty and based on current economic projections, the world is on track to reduce the number of extremely poor people by half, the World Bank and IMF said in a report. "Two-thirds of developing countries are on track or close to meeting key targets for tackling extreme poverty and hunger," the World Bank and IMF report -- "Global Monitoring Report 2011: Improving the Odds of Achieving the MDGs" said. Giving statistics, the report said the number of people living on less than USD 1.25 a day is projected to be 883 million in 2015, compared to 1.4 billion in 2005 and 1.8 billion in 1990. Regarding India, the report said in 1990 as many as 51.3 per cent of Indian population was living on less than USD 1.25 a day, which got reduced to 41.6 per cent in 2005 and is expected to further decline to 22.4 per cent in 2015. The decline in poverty has been more drastic in China, where in 1990, as much as 60 per cent people were living under USD 1.25 per day, which is likely to reduce to 4.8 per cent by 2015, the report added. Commenting on the findings, World Bank director of development prospects Hans Timmer said "reaching the MDGs is a significant achievement for developing countries. But there is still much to do in reducing poverty and improving health outcomes even in the successful countries". Among developing countries, 45 per cent are far from meeting the target on access to sanitation; 39 per cent and 38 per cent are far from the maternal and child mortality targets, respectively, the report added. "The challenge in low income countries is to sustain and accelerate growth through better policies that will create jobs and greater opportunities for the private sector," Hugh Bredenkamp, deputy director of the IMF's Strategy, Policy, and Review Department said. Here's a story from The Hindu (20/04/2011). It was headlined saying - "Poverty rate declines from 37.2% to 32%". The latest data of the Planning Commission indicates that poverty has declined to 32 per cent in 2009-10 from 37.2 per cent five years ago. The preliminary estimates are based on the formula suggested by the Tendulkar Committee for computing the number of poor. Planning Commission Deputy Chairman Montek Singh Ahluwalia on Wednesday told reporters that the 2009-10 data shows a decline in poverty from 37.2 per cent in 2004-05 to 32 per cent in 2009-10 as the per the preliminary data worked out by the Planning Commission member Abhijit Sen. The Tendulkar Committee had suggested that poverty be estimated on the basis of consumption based on the cost of living index instead of caloric intake. It said that the basket of goods should also include services such as health and education. The new poverty line, as suggested by the Tendulkar Committee, is different for rich and poor States, and for rural and urban areas within a State. “These are preliminary data. Mr. Sen has worked on them. He has reported that the 2009-10 data shows a decline in poverty from 37.2 per cent in 2004 to 32 per cent in 2009. I agree with him,” Dr. Ahluwalia said. He said the National Sample Survey, which conducts large sample surveys every five years, will launch its next round in 2011-12. Estimates of poverty are important because the cheap grains under the proposed Food Security law will be provided based on these numbers. Dr. Ahluwalia also raised doubts over the feasibility of achieving 10 per cent average economic expansion in the 12th Plan (2012-17), and said the next plan would target GDP growth of 9 to 9.5 per cent in the next five years. “If you ask me personally, I think setting the target of 10 per cent GDP growth as an average for [the] 12th Plan is not feasible. It would be somewhere between 9 and 9.5 in the next Plan period,” he said. TC: "It is quite amazing how Pakistanis (especially the educated) use India as their yardstick..."
Do you think the above headline suggests that "Indians (especially the educated) use Pakistan as their yardstick"? pakistan is ahead of india in shortage of power too. since 12 hours, DawnNews reported. Loadshedding period in the residential areas is also expected to rise. KM: "pakistan is ahead of india in shortage of power too." "On the ground, of course, the reality is different and first-time visitors to Pakistan are almost always surprised by the country's visible prosperity. There is far less poverty on show in Pakistan than in India, fewer beggars, and much less desperation. In many ways the infrastructure of Pakistan is much more advanced: there are better roads and airports, and more reliable electricity. Middle-class Pakistani houses are often bigger and better appointed than their equivalents in India." Since 2008, the situation has rapidly deteriorated mainly due to the problem of "circular debt" rather than just the constraints in generating capacity. This is in response to you citing a few headlines from the indian media to argue that the Indians use Pakistan as a yardstick. There is a journalistic practice, though debated by few but followed by many, that says - Dog biting man is not news, but man biting dog is!! Most journos would agree with that. Yes, Pakistan is used as a reference point. But only to indicate areas where India still lags behind, and not where the country aspires to be. To represent our aspirations, journalists dish out generous helpings of stats and headlines concerning China and US - NOT Pakistan. Moreover, the reason that you could google up so many headlines from the indian media was because, Pakistan managing to outperform India is one of the few rare cases, which qualifies for - "man biting dog". Furthermore, the headlines always revolve around the most striking element of the story - which again, in this case, proves that it is startling (confusing and embarassing, if you ask me) to have Pakistan with its nose ahead. Hence, the refereal to pakistan to stress on the obvious news point. Hope this brief explanation helps you in overcoming the spurt of wishful thinking. Here's a case in point of India looking beyond Pakistan when confronted with questions of growth and development. It's an inforgraphic that gives charts and stats about the road ahead for India. No observrb that despite the the array of tables, charts and stats on display - there is no mention of Pakistan!! An indication of not only that India is NOT obsessed with Pakistan, but also that in the scheme of things, Pakistan doesn't quite feature prominently on the world map. Ashmit: "Pakistan managing to outperform India is one of the few rare cases, which qualifies for - "man biting dog"." Few areas? How many headlines did you see me cite? Few? And what are these headlines about? These headlines deal with essentials like food, nutrition, sanitation, health, life expectancy, gender gap, roads, etc in which Pakistan is ahead of India. Asmit: "but also that in the scheme of things, Pakistan doesn't quite feature prominently on the world map." It's just more propaganda from "Shining India" crowd that ignores the fact that, after 63 years, India is still home to the world's largest population of poor, hungry, illiterate and sick people.
" India is still home to the world's largest population of poor, hungry, illiterate and sick people." Ahh...Its almost like deja vu. Your old weapon - wielding the social indicators. I'll come to that in just a bit. But firstly, most of the objective assessments carrid out by various agencies, peg India amongst the top 3 economies in the forseeable future. Whereas, even the most optimistic of economists see only a secondary role for Pakistan. Ranked somwhere between 15-25 by the year 2050 (according to various analysts). And these assessments are arrived at by gauging the current scenario and potential. So the social indicators that you quote, which are out in public domain, do figure in the calculation of these prediction and yet we somehow manage to be at the top. We must be doing something right, right?! So before, you reject my arguments as extrapolations based on "proapaganda" in the indian media - take a look at the following. Even if not headed for superpower status, even the most conservative of estimates put india much beyond the reach of countries such as Pakistan. Ashmit:"But firstly, most of the objective assessments carrid out by various agencies, peg India amongst the top 3 economies in ..."
I am quite familiar with the usual "Shining India" hype you refer to. But it's by no means objective. "I am quite familiar with the usual "Shining India" hype you refer to." You are replies are increasingly disappointing, and seemingly written more out of jingoistinc complusions than reasoning. You made use of exactly 13 words to write off 87 pages of well thought out and researched ideas that i quoted?! "But it's by no means objective." Are you implying that agencies such as Goldman Sachs, PriceWaterhouse Coopers, and analysts such as Tushar Poddar and Eva Yi have been collectively are particiapting in a co-ordinated, pre concieved, calculated approach to sideline Pakistan, and boost egos in India? And that you can fully refute any and all the claims put forth in these papers? Or that I am being naive in ignoring a similar report that speaks of Pakistan as a "resurgent" power that will upset India and China and steal their thunder? If the answer to all of the three questions is "Yes", perhaps your position is vindicated and my world view is flawed. But if the answer to any of the above is a "NO" - perhaps you could do with a rethink. And onto the observations made by Paul Beckett - Maoism, Corruption, Black Money, Income Disparities, Caste Differences, lack of a clear mandate, poverty in rural areas, Kashmir - these concerns have been around for perhaps as long as you are old and more. These have not been enabling factors, but disabling factors. And that is what provides the logical conclusion that India has grown inspite of them, not because of them. Enlighten me as to why factors that have been in existence over the last 2 decades but could not derail the growth story - are likely to do so now. Also educate me on how pakistan fares any better in terms of potential for economic growth. And if it does, why is it that outside of perhaps armed conflict and cricket (btw the winning streak against Pak at WCs continued)- Paksitan has failed to compete with India and to present itself to the world as a viable alternative to India as a subcontinental power, as a growth engine, as an economic powerhouse? Pakistan is not a failed state, but loyalists such as yourself find the consistent need to fight off such perceptions. On the other hand, India is not a superpower, but people such as myself are compelled to look at a host of positive indicators and refute the claims of the naysayers. This gulf between the factors inspiring the two sides should tell one all that one needs to know anout status quo between India and Pakistan. Ashmit: "Are you implying that agencies such as Goldman Sachs, PriceWaterhouse Coopers, and analysts such as Tushar Poddar and Eva Yi have been collectively are particiapting in a co-ordinated, pre concieved, "
Goldman and others' deception has been exposed in the US sub-prime crisis that has made millions of Americans homeless and jobless. Their recommendations can be very dangerous to the health of the nations and economies they analyze. And if it's too much a risk trusting Goldman Sachs - how about the ADB?! and Thailand. Notably, Pakistan is NOT one of the 7 countries at Asia's High Table. Take a read. I don't you or GS or ADB or your fellow Indians in "India Shining" crowd get it. Your misguided arguments remind me of the whole reason why Dr. Mabhub ul-Haq argued for using social indicators, not just the GDP, as a measure of a nation's well-being. There is a description of Mahbub ul-Haq's thinking on page 12 of the Human Development Report 2010. It is titled "From Karachi to Sorbonne--Mahbub ul-Haq and the idea of human development". But, as the report puts it, "The young economist shocked his audience by delivering a stinging indictment of Pakistan's development strategy" for favoring the elite at the expense of the poor. A few years later, Mahbub ul-Haq persuaded UNDP to push for research reports and social indicators as an alternative to single-minded focus on GDP. KARACHI: Lotte, the parent company of Lotte Pakistan PTA Limited, has hinted at expanding its operations in Pakistan, besides entering into other businesses such as confectioneries and constructions, officials said on Tuesday. “If government of Pakistan offers us some concessions in taxation then we are keen to expend operations of Lotte Pakistan with a fresh investment of $500 million,” said Jung Neon Kim, Executive Director of Lotte Pakistan. The PTA plant was acquired by Lotte in September 2009 and renamed as Lotte PTA Pakistan Limited. Kim said Lotte is also in the process of acquiring Kolson. Therefore, it is about to enter the confectionary and food businesses in the country, as well. The parent company also wanted to concentrate on the beverage industry, as well as expand into the chemicals and construction sectors, he said. To attract more foreign investment and foreigners to the country, he said, Lotte wanted to develop and build residential projects exclusively for foreigners where they could live and enjoy sports and cultural facilities along with full security. He said that his company was the tenth largest taxpayer in Pakistan, contributing around Rs20 billion to the national exchequer in the form of taxes. In his opinion, the tax rates in Pakistan were among the highest in the region and should be reduced to attract more investment. Lotte Pakistan took CSR (Corporate Social Responsibility) very seriously and spent Rs400 million on CSR activities last year, besides contributing to the relief efforts for flood victims. He said Lotte is intensely involved in education and around Port Qasim where Lotte Pakistan PTA plant is located. Lotte, he said, is committed to spending Rs60 million annually on education in the area. Overseas shipments by Australia, the grain’s fourth largest exporter, have already suffered from the country’s strengthening currency, while a return of Black Sea cargoes, after last year’s drought, promises to worsen the situation. “There is around $80 spread between the two origins, which makes it attractive for millers to take Pakistani wheat, even though Australian is of better quality,” said a Singapore-based grains trader. Australian wheat sales have slowed in the past few weeks as a strengthening currency has lifted prices for overseas buyers, while Pakistan has sold some one-and-a-half million tons into the global market since it resumed overseas sales. Pakistan is making inroads into Australia’s traditional strongholds of Indonesia and Malaysia, while striking deals with millers in Bangladesh, the United Arab Emirates and Tanzania at prices between $300 and $310 a ton, free on board. This compares to Australian prime wheat (APW) being offered around $380 a ton. The State Bank of Pakistan held its discount rate unchanged at 14.00% as inflation pressures eased somewhat, and as the Bank waits to analyze next month's annual government budget. The Bank noted: "The government is mindful of fiscal pressures and has expressed its resolve to address these issues, especially containment of the fiscal deficit. The budget for FY12 is expected to reflect this commitment,". Pakistan reported annual inflation of 13.04% in April (with prices rising 1.62% month on month), on inflation the Bank commented that "the average CPI inflation for FY11 is likely to remain between 14 and 14.5 percent, which is lower than the central bank's earlier projections,". ISLAMABAD, May 5: The per capita income in Pakistan rose by 9.5 per cent to $1,207 in fiscal 2010-11, the highest growth in recent past reflecting an improved well-being despite a slowdown in the economy. As calculated by the federal bureau of statistics here on Thursday this could mean a jump of $105 per capita for 175.31 million population in 2010-11. The per capita income is the average of the income between the very rich and the very poor and those in the middle. The economists define per capita income as Gross National Product at current market price in dollar terms divided by the country’s population. The per capita income was $586 in 2002-03, which rose to $926 in 2006-07 and $1,085 in 2007-08 but now jumped to $1,207. The size of the economy also peaked to Rs18.8 trillion for the financial year 2010-11, up by 22 per cent from Rs15.4 trillion in the corresponding period last year. But economic growth is projected to fall to 2.4 per cent by end June 2011 from a revised target of three per cent. As a result of stagnation in economic growth in the past three years, the per capita income also did not witness any substantial growth in dollar term. But the real purchasing power of the people also eroded rapidly as inflation entered into double-digit making essential goods dearer for the poor people. The per capita income in Pakistan has increased due to large inflow of home remittances from the overseas Pakistanis. This year the remittances were expected to cross the $10 billion mark, which would be the highest ever in the country’s history. ....Raising the wage several-fold for works and farm manager, and also offering bonus incentives for performance, has led to positive competition that can help to erode the feudal levels of income disparity which exist in this part of Pakistan. At the same time, Daniyal is also committed to providing new livelihood paths for the agrarian workers as automation reduces farm employment in some areas. He has has fully funded a school and provided a merit-based scholarship for advanced degrees to students from the nearby village. One of the children from this school (the first in his family to even go to school) is now making his way through medical school in Lahore! The State Bank of Pakistan has set Rs 285 billion target for disbursement of agriculture loan among small farmers for current fiscal year. Director Development Finance of SBP Karachi, Dr Muhammad Saleem said this while addressing "Agricultural & Industrial Awareness Convention-2012" here on Tuesday. Khyber Pakhtunkhawa Higher Education Minister Qazi Muhammad Asad Khan participated as chief guest in the convention organised by the State Bank, Rawalpindi in collaboration with commercial banks and insurance companies. More than 120 stalls of handicrafts, clothing agriculture equipment, handmade beautiful jewellers, banking products and food, etc, were set up by women from various organisations and banks to promote rural culture and potential of trade in these areas. Horse dancing and culture displays made this event more beautiful. 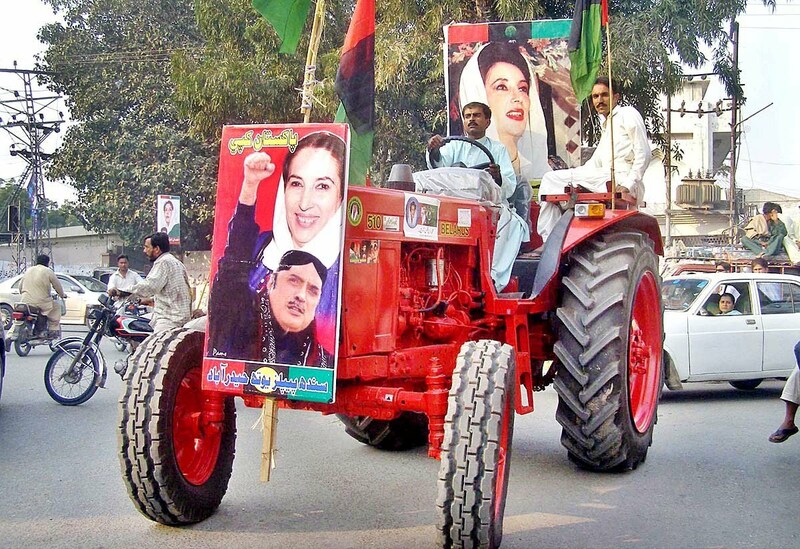 More than 1500 people including students, farmers and women participated in the convention. Chief Manager State Bank Akhtar Raza, Group Head of United Bank Ltd (UBL) Jameel Ahmed, Vice Chancellor Hazara University Haripur, Professor Dr Sahawat and others were also present on the occasion. Dr Muhammad Saleem said the SBP had set Rs 270 billion agriculture loans target for small farmers in the previous financial year while actually Rs 260 billion loan was distributed among farmers. He said that agri loan is being given to farmers through one-window operation. He said farmers could give better output if banks provide them loan in time on easy instalments. "Agriculture is backbones of our economy and its share in Gross Domestic Product (GDP) is 21 percent. Livelihood of 47 percent people is directly or indirectly is linked with agriculture sector. The SBP is playing pivotal role in progress of agriculture sector by providing loans especially to small farmers," he said. Dr Muhammad Saleem said the SBP formulates policy in consultation with all the stakeholders including farmers. The SBP changes its policy with passage of time by keeping the necessities of farmers in view. Addressing the convention, Khyber Pakhtunkhawa Higher Education Minister Qazi Muhammad Asad Khan said land of Haripur is fertile and the farmers of this area can give maximum production if they were given some financial support for seed, fertiliser and tractor and other inputs necessary for increasing production. He urged the SBP to set up its branch in Haripur for promotion of small industries and agriculture sector. About the Haripur University, He said Haripur has also become a part of the community of 120 universities. "The government should increase budget for education to 4% of GDP. The quality of education can only be improved by increasing the budget for this sector. Group head of UBL, Jameel Ahmed said the State Bank has good legal framework and governance in the region. The employees of the Bank are servants of people. "It is your money and used to benefit you," he added. Vice Chancellor Hazara University Haripur, Professor Dr Sahawat said knowledge-based economy and use of latest technology is of vital importance for progress of agriculture sector. Productivity of major food crops such as wheat, rice, maize and pulses in India is almost half of that in neighbouring China, according to a data. In fact, yield of staple grains like maize and pulses in India is even less than that of countries like Pakistan, Bangladesh, Nepal and Myanmar, the data presented in Parliament by Agriculture Minister Sharad Pawar last week said. The productivity of rice in India is 3,264 kg per hectare, while in China it is 6,548 kg a hectare, the data compiled by UN's agriculture body FAO for the year 2010 said. It is also high in Bangladesh at 4,182 kg/hectare and Myanmar at 4,123 kg per hectare. China also tops the list in wheat with yields of 4,748 kg per hectare, whereas for India it stands at 3,264 kg a hectare. India stands at the bottom in terms of maize and pulses productivity compared to China, Pakistan, Bangladesh, Nepal, Sri Lanka and Myanmar. Bangladesh leads the tally in terms of maize yields with 5,837 kg per hectare, followed by China at 5,459 kg a hectare, Myanmar 3,636 kg/hectare, Pakistan 3,558 kg per hectare, Nepal 2,118 kg every hectare, Sri Lanka 2,806 kg a hectare and in India it is 1,958 kg/hectare. In pulses, China tops the list with 1,567 kg per hectare followed by Myanmar at 1,114 kg a hectare, Bangladesh at 871 kg/hectare, Nepal 791 kg per hectare, Pakistan 762 kg every hectare, while in India it stands at 694 kg per hectare. Pawar said that productivity depends on factors like rainfall, extent of inputs such as fertiliser, micro-nutrients, seed replacement rate, duration of crop, extent of area sown under any crop and the nature of lands used for cultivation. To enhance the agricultural production, the government is working on frontier areas of research like marker assisted selection, stem cell research, nanotechnology, cloning genome resource conservation, Pawar said. The National Institute of Abiotic Research Management has been established in Maharashtra to address issues related to impending climate change, he added. That apart, the National Institute of Biotic Stress Management and Indian Institute of Agricultural Biotechnology are in the pipeline for undertaking high quality research, the minister added. The export of the meat increased from $108.54m (2010-11) to $123.61m in 2011-12, showing an increase of 13.9pc. An official of Ministry of National Food Security and Research told Our Sources that the future plan for the livestock sector is to persuade the policies to achieve 5pc or more growth in meat and 8pc or more in milk production through shifting from subsistence livestock farming to market-oriented and commercial farming. Rising meat exports is good news. Pakistan is in the middle of a major livestock revolution that is boosting domestic consumption and increasing exports of milk and meat products. This is great for Pakistan's rural economy. It'll reduce rural poverty and improve the lives of the people living in villages and small towns. The overall produce of rice has been estimated to reach 6.16 million tons during the current year, showing an increase of 28 percent over that of last year, official sources told APP. “Following the remarkable increase in the yield, the rice export is expected to grow considerably during the current fiscal (2012-13),” said sources in the Ministry of National Food Security and Research. They opined that it was due to prudent and pro-farmer policies of the government that rice export from Pakistan remained over US $ 2 billion for the last four years consecutively. Giving break-up, the sources said that the rice export fetched US $ 1.836 billion 2007-08, $ 1.983 billion in 2008-09, $2.160 billion in 2009-10, $.2.160 billion in 2010-11 and $ 2.061 billion in in 2011-12. The sources said that in the year 2009-10 rice was cultivated at an area of 2.88 million hectares with produce of 6.88 million tons, in 200-11 rice was cultivated at an area of 2.37 million hectare with produce of 4.82 million tons and similarly in 2011-12 rice was cultivated at an area of 2.57 hectares with 6.16 million tons produce. They said that the rice was a major cash and important food crop of the country after wheat and its produce comprised 40% basmati (fine) and 60 percent coarse types. The government, they added during 2008-09 and 2009-10 intervened in order to support farmers as the rice price hit the rock bottom due to bumper crop and plummeting international price. Highlighting the major issues, the sources said that in view of good returns of the rice crop, there is a spread of basmati varieties in non-basmati zone. “It may affect basmati rice exports in the long run as the basmati produced in non-basmati zone lacks aroma”, they observed. The sources added that due to higher yield of hybrid rice, farmers are also shifting the Irri-6 to hybrid rice and the hybrid rice quality is low compared to Irri types. They further said that rice crop is low in productivity and production is affected by water shortage and there are enormous post harvest losses and issue of Afflatoxin which affect crop value and quality especially in case of rice export. They stressed the need for more investments in general research and development in rice for further increasing its production. The sources said that Pakistani basmati rice was one of the top rice commodities all over the world, but the exports of this rich rice commodity witnessed sharp decline of 14.87 percent during the last fiscal year 2011-12 as compared to the previous year. Engro with its rich history of over four decades of developing the agricultural sector of Pakistan used dairy as a stepping stone to enter the foods business in 2005 to give further impetus to its already diversified business portfolio including fertilisers, petrochemicals, energy, trading and chemicals storage and handling. In a span of just seven years, with a compound annual growth rate (CAGR) of 65 percent and a planned infrastructure investment in 2012 to the tune of eight billion rupees, Engro Foods has become the country's fastest growing local company catering to a wide demographic consumer base from high income groups to the more economically conscious segment of the market both in Pakistan and abroad. Serving over five million consumers nation-wide every day, Engro Foods had revenues of about Rs 19.76 billion during 1H-2012 with profitability registering an increase of over 450 percent to close at Rs 1.02 billion. Since its inception Engro Foods has invested heavily in dairy development initiatives, cold chain infrastructure, enhancing capabilities of dairy farmers across Pakistan through innovative breakthroughs that have redefined the milk collection standards and benchmarks in the dairy industry. Employing over 12,000 individuals both directly and indirectly, Engro Foods' continues to touch and improve life for over 160,000 dairy farmers through improved payment cycles, guaranteed collection, improved margins and up to a 15 percent increase in milk yields. Through its wide network of over 900 milk collection centres, Engro Foods focuses its impact at the most economically challenged communities in Pakistan - an effort that has also been recognised at local and international fronts including the IFC managed G20 Challenge on Business Innovation where Engro Foods was declared the winner from over 300 global contracts. The Company also had the unique opportunity to become the first company in Pakistan to produce one billion packs within a year in 2010 alone; a distinction that has been achieved by only 18 companies out of 3,000 Tetra Pak customers world-wide. Living its vision of 'elevating consumer delight world-wide' the business established its Global Business Unit (GBU) and acquired Al-Safa Halal - the oldest Halal meat brand in North America in 2010. With presence in key retail stores including Loblaws, Wal-Mart, Sobeys, Metro, Kroger etc, Engro Foods GBU has obtained a market share of 15 percent in Canada and three percent in USA in the branded foods category. Speaking at the occasion, Afnan Ahsan - CEO Engro Foods said: "The story of Engro and that of Engro Foods is a source of national pride. The fact that in a short span of seven years a home-grown multinational company has been created - with a geographic footprint spanning across Pakistan, Afghanistan, US and Canada - is testament to the vision and business acumen of the Company. Engro Foods is an example that through focused approach companies can create real business value - not just in the Pakistani market but also globally." Building on plans for the future of the Company Afnan said: "We are in the early stages of our growth trajectory and looking ahead we will continue to further explore diversification with focused growth in our dairy and beverage business - both locally and on the international front. We are also confident that we will continue to create real value for all our stakeholders by pursuing an inclusive growth strategy that positively impacts each individual through the value chain process." No matter what the prophets of doom say in nightly news shows on TV day in day out, an overwhelming majority of Pakistanis still believes that hard work is duly rewarded in the country and leads to material success, according to a recent poll by Pew Research Center — a nonpartisan “fact tank” in Washington DC. In fact, of all the 21 countries where the survey was conducted, Pakistan came on top with 81% of respondents saying people succeed if they work hard as opposed to 15% who believe hard work is no guarantee of success. The United States followed Pakistan with 77% of respondents saying hard work assured success. India, China and Japan were more sceptical with only 67%, 45% and 40% of the respondents recognising a close link between hard work and success, respectively. The survey was conducted between March 28 and April 13 in all provinces face-to-face with 1,206 people of the age of 18 years or more. While a majority of Pakistanis tend to have faith in the existing economic system to reward them with success if they work hard, less than half of Pakistanis approve of the free-market economy, reveals the survey. About 48% of the respondents think people are better off in a free-market economy, down from 65% three years ago. “I’m not surprised that the percentage of people having faith in the free-market economy has dropped significantly in recent years. We don’t have a free-market economy. The sham system that’s in place is actually reflective of a rent-seeking economy, where self-interest is pursued shamelessly at the highest level of the government,” Umar said. Talking to The Express Tribune, first-generation entrepreneur Shakir Husain, who is involved in several national and international ventures, said most Pakistanis don’t even understand the basics of the free-market economy. “I’ve found that even educated Pakistanis are least versed in economics and the working of the free market. TV channels have added to the problem, where they tend to politicise structural issues that confuses people further,” he said. The Pew survey also revealed that about 76% Pakistanis think that the economy will either worsen or stay the same in the next 12 months. The corresponding figures for India and China are 49% and 11%, respectively. When asked if their standard of living is better than the standard of living of their parents when they were of their age said they are worse off. Among those who think the economy is doing poorly, roughly one-third of the respondents in Pakistan held the United States responsible for bad economic conditions. Another one-third said that people are themselves to be blamed for the bad economy. On the other hand, almost two-thirds of the respondents in India blamed themselves for the bad economy. “It’s easier for the average Pakistani to simply blame the entire ‘system’ without understanding the root of the problem. Also, our politicians and bureaucrats are not honest about their own shortcomings. Hence, the blame is put on ridiculous things,” Husain said. Most photographs in Pakistan depict something awful or its immediate aftermath: suicide bombings, a horrible earthquake, even more horrible floods, unimaginable grief. The Spanish photographer Diego Ibarra Sánchez, who made Pakistan his home for five years, saw something different amid all the tragedy: hope. His latest project, called “Resilience, Pakistan,” is the culmination of small moments from his time there, until he left in 2014 after visa problems and intimidation by the country’s main spy agency. Mr. Ibarra divided this work into two categories: “Nightmare,” for the kind of images one expects from Pakistan, and “Hope,” for less frequently seen images of daily life, like a taxi driver in his car at night, young men playing pool, even a model at a fashion show. Mr. Ibarra, 33, left Barcelona for Pakistan in 2009 almost on a whim. He won a photo contest for taking pictures at a mall, bought a secondhand lens with his winnings, went on a brief trip to Pakistan and then packed up his belongings to move there six months later. Some have a dramatic story behind them. In one, young men are silhouetted at night by fires raging after a Taliban attack on NATO supply trucks heading for Afghanistan. No one was killed in the blaze near the tribal agencies, but Mr. Ibarra, who didn’t have a permit to be there, had to flee when agents from the country’s main intelligence agency, Inter-Services Intelligence, or ISI, showed up in the early-morning hours. There are also photographs of small acts of protest: a man nervously watching a movie in the Swat Valley, even though the Taliban loathe cinema. Pakistan can be a maddening place to be a foreign journalist, as much of one’s effort goes toward figuring out how to work despite efforts by the government and the ISI to control stories and news events. It is a country where journalists are constantly followed, where they can be kicked out for seemingly innocuous reasons, where the daily grind of shaking someone from ISI can range between humorous and scary.